Booth Movers has the experience and expertise to make moving to a new state a stress-free experience! Our New Jersey interstate moving company has been providing quality moving services to the Bergen County area and beyond since the 1940s. Since the beginning, we have shown a deep commitment to professionalism and integrity, which is why our BBB-accredited business is a member of both the American Moving & Storage Association (AMSA) and the New Jersey Warehousemen & Movers Association. With the AMSA's ProMover designation and our state-of-the-art equipment, we guarantee that using our New Jersey interstate movers will make your relocation an experience that exceeds expectation! Booth Movers is proud to be an agent for Atlas Van Lines – one of the most trusted names in the transportation industry. Through Atlas, we are a part of a nationwide network of moving professionals that have the experience to handle any-sized household relocation. From start to finish, our New Jersey interstate movers will work with you through each stage of the moving process. Starting with a free, in-home estimate, Booth Movers will help you determine the New Jersey interstate moving services that best suit your needs. Our qualified team members will always be available to guide you through every stage of your move. Every move has a unique set of needs, and our New Jersey interstate movers are trained to handle relocations of any size or scope. No matter what interstate moving services you need, we can customize a moving package that suits your budget. Apartment Moving – When it comes to apartment moving, there is no job too big or small for our team at Booth Movers! Senior Moving – Our New Jersey interstate movers will work with you to ensure your senior moving needs are handled with the upmost care and compassion. Household Moving – Regardless of the size of your home, our professional crew has the experience to make your relocation a stress-free experience! Full Service Moving – Our wide variety of moving and storage solutions guarantee that your move will be customized to suit your unique needs. 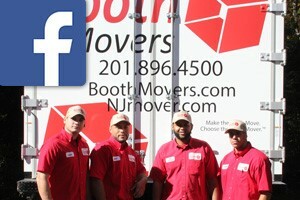 As New Jersey’s first choice in nationwide movers, Booth Movers has satisfied thousands of customers across the country. To find out how we can help you with your New Jersey interstate moving needs, give us a call or fill out our online form today for your free moving estimate!